Love this series and have been looking forward to a new transfer for Blu-ray / 4K. Buyer beware the digital copy is unlocked via Vudu but is only available in SD. If I had know I would probably have purchased via iTunes which has a 4K version available. Japanese folklore is rich with monsters and demons... so it seems appropriate that Hellboy would encounter one or two along his way. 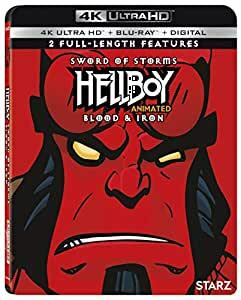 And the animated spinoff movie "Hellboy: Sword of Storms" does a decent enough job ushering some fun Japanese goblins and monsters into Mike Mignola's world. The entire storyline is rather straightforward and bogged down by a tepid tragic-love-story-from-the-past that putters out, but Hellboy's adventures in a menacing Wonderland and the attacking dragons make for a good adventure story. First off: the team ventures into a green, slimy, root-filled underground temple, where they must battle an ancient bat-deity and a small army of Aztec mummies. Then to the main plot -- a history professor receives an ancient scroll that tells the story of the demonic brothers Thunder and Lightning, and a doomed love between a princess and a young samurai. And when the professor finds the samurai's sword -- surprise! -- he gets possessed by the demons. "Hellboy: Sword of Storms" is not quite the twisty, mysterious tale that its sister story "Blood and Iron" is: it's a pretty straightforward action/fantasy story of monstrous creatures about to be unleashed on the world, and a rather sentimental ghostly "Romeo and Juliet" tale. The latter is the weakest part of the entire movie, actually -- none of the ghosts are very interesting, and the climax of their subplot just sputters out and dissolves like a wet firecracker. Fortunately the rest of the story is more entertaining -- lots of thunderstorms, very angry dragons, and Hellboy's rather peeved journey through a very creepy world of Japanese legend. Bouncing-head goblins, a vicious kappa ("He really likes cucumbers... WHAT IS YOUR NAME?! "), an eerie spider-woman who spins bloodied threads on an instrument, and a fox that has a knack for turning into a wise old lady all make appearances, and most of them end up at the wrong end of Hellboy's stone fist. Of note: The head-goblins actually are from a Mike Mignola short story that goes the same way, but the writers managed to sneak in a few other references to Mignola's comics (including Katie rambling about a mythic king and his berserker warriors). Ron Perlman's vocals make this Hellboy absolutely perfect -- he's sarcastic but good-hearted ("You're lucky we let you be seen with us! "), while Doug Jones is excellent as the resourceful, mellow fish-man Abe. Selma Blair has some trouble (which she admits, if you watch the making-of featurette) making Liz sound lively, but after some initial rockiness she does manage it. And the animation is pretty good stuff -- the jewel-toned landscapes of Japanese legend have a bad habit of turning into spooky nightmares. "Hellboy: Sword of Storms" suffers somewhat from a padded ghostly-romance subplot, but the rest of it is a solid, straightforward tale of Japanese folklore and the occasional cursed sword. Worthwhile spinoff. 3.0 out of 5 starsOnly digital SD quality when you buy it in 4K Ultra. I have nothing against the 4K quality of the disk, I’m angry because the digital code is only in SD and only Vudu is acceptable. They have to automatically change that for everyone who has purchased this product as an apology. I didn’t pay for DVD quality. Also what is up with Apple having these movies in 4K, but not Vudu?